For nightclub events with no speaking, see Quiet Party. For 2011 play by Lachlan Philpott, see Silent Disco (play). A silent disco or silent rave is an event where people dance to music listened to on wireless headphones. Rather than using a speaker system, music is broadcast via a radio transmitter with the signal being picked up by wireless headphone receivers worn by the participants. Those without the headphones hear no music, giving the effect of a room full of people dancing to nothing. In the earliest days of silent discos, before 2005, there would be only one channel available to listen to music through. Over time, the technology moved along to where there were two, and later technology allowed for a third channel that three separate DJs could broadcast over at the same time. Silent discos are popular at music festivals as they allow dancing to continue past noise curfews. Similar events are "mobile clubbing" gatherings, where a group of people dance to the music on their personal music players. An early reference in fiction is Astroboy's 1967 japanese science fiction story The Summer of 1993. Where the titular character attends a party where everyone wears headphones. The concept was used by eco-activists in the early 1990s, utilizing headphones at outdoor parties to minimize noise pollution and disturbance to the local wildlife. In 1994, the Glastonbury Festival linked its on-site radio station to the video screen sited next to the Main Stage, allowing festival goers to watch late night World Cup football and music videos on the giant screen after the sound curfew by using their own portable radios. The idea was the brainchild of the project manager from Proquip, who supplied the giant screen, and engineers from Moles Recording Studio in Bath, Somerset, who were working with Radio Avalon. In May 2000, BBC Live Music held a "silent gig" at Chapter Arts Centre in Cardiff, where the audience listened to a band, Rocketgoldstar, and various DJs through headphones. In May 2002 artist Meg Duguid hosted Dance with me... a silent dance party at the Museum of Contemporary Art Chicago where she created an outdoor club installation complete with velvet ropes and glow rope in which a DJ spun a transmission to wireless headsets that audience members put on and danced to. Duguid threw a second dance party at the Museum of Contemporary Art, Chicago the following year, entitled Dueling DJs where two DJS simultaneously spun two separate musical transmissions various wireless headsets that audience members put on and danced to. This performance was repeated the following year (2004) at the Chicago Cultural Center. The term "silent disco" has been in existence since at least 2005 with Bonnaroo Music Festival advertising such an event that year with DJ’s Motion Potion, Quickie Mart and DJ medi4 and headphones provided by KOSS. In the Netherlands, the traveling arts and culture festival De Parade already featured a "stille disco" [silent disco] earlier, for example in 2003. Dutch DJs Nico Okkerse and Michael Minton have been described as "the pioneers ... in the legend of silent disco" because they started "stille disco" events in 2002. Okkerse claims his company 433fm.com "created Silent Disco in 2002" and its site does have photos from such events going back to at least 2003. HUSHconcerts (previously, Silent Frisco) was the first company to produce a multi-city Silent Disco tour in 2008 with Silent Soundclash  kicking off at Winter Music Conference in Miami, followed by Atlanta, Athens, Savannah, Wilmington NC, Charlottesville Va, Baltimore, New York City, Syracuse, Pittsburgh and St. Louis. During this tour, the company became the first to produce American silent discos on a beach (Miami Beach) and a boat (the Rocksoff Cruise in New York Harbor). The Oxford Dictionary Online added the term "silent disco" to their website in February 2011. As interest has increased, there has been a rise in the number of companies organizing parties and providing events with wireless headphones. Some companies have offered home kits. Another type of silent party, known as mobile clubbing, involves the gathering of a group of people in an unconventional location to dance to music which they provide themselves via a portable music device, such as an MP3 player, listened to on headphones. These flash mob gatherings may involve hundreds of people, transforming public spaces into temporary clubbing areas, in which dancers listen to their personal playlists. To an observer it would appear that the participants are dancing for no apparent reason. Mobile clubbing events are organized using mass-emails, word-of-mouth or social networking websites such as Facebook, or a combination of these methods. The first event, organised by London-based artists Ben Cummins (also founder of Pillow Fight Club) and Emma Davis, was at London's Liverpool Street Station in September 2003. Over the next five months there were a further five events at other London train stations including Waterloo, Charing Cross and London Bridge. By the end of 2008 there had been more than twenty of these events at similar venues throughout London, mostly train station concourses or other public spaces that lend themselves to expressive dancing and rapid dispersal. An event in 2007 at Victoria Station, London involved 4,000 participants. The event was broken up by police two hours later. 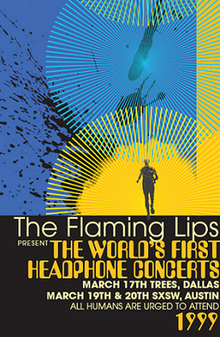 A Flaming Lips poster promoting "The World's First Headphone Concerts"
A headphone concert is a live music performance where the audience, in the same venue as the performing artist, listens to the music through headphones. The idea originated in 1997 when Erik Minkkinen, an electronic artist from Paris, streamed a live concert from his closet over the internet to three listeners in Japan. The concept led to a decentralized organization known as le placard ("the Cupboard"), which allowed anybody to establish a streaming or listening room. The first headphone concert taking place in front of a live audience took place March 17, 1999, at Trees in Dallas, Texas. The American psychedelic band The Flaming Lips used an FM signal generator at the venue and handed out mini FM radio receivers and headphones to each member of the audience. A normal speaker system was also used so the sound could also be felt. This continued on their "International Music Against Brain Degeneration Revue" tour with mixed results, with technical problems including dead batteries and intoxicated audience members having trouble tuning to the correct frequency. Another headphone concert was performed in the Chapter Arts Centre, Cardiff in April 2000 by Rocketgoldstar. Later headphone concerts used specially designed wireless 3-channel headphones, better in-house custom made transmitters and no speakers or any live PA in the venue. Major events hosting headphone concerts included the 2005 Glastonbury Festival, 2010 Shift Festival in Switzerland, the 2011-12 Van's Warp Tours across North America, Sensoria 2012 in Sheffield, UK, the 2012 Bonnaroo Music Festival in Tennessee and the Hoxeyville Music Fest in Michigan. In 2012, Kid Koala performed a "Space Cadet Headphone Concert tour" around the world. A variant of the headphone concert involves live bands competing for the audience, who are able to choose which band's frequency to receive. In August 2008, the first silent Battle of the Bands was held at The Barfly music venue in Cardiff. The event featured bands going directly head-to-head, with a stage at each end of the venue, allowing gig-goers to choose which group they wished to listen to. Theatre and performance companies are now beginning to exploit silent disco technology as well. In 2009, with the help of SilentArena Ltd, Feral Productions began using an experimental approach – a mixture of narrative-led performance, sound art and guided exhibit. Their first performance, The Gingerbread House, took the audience from The Courtyard, Hereford on a journey through a multi-storey car park in the centre of Hereford. In 2010, their second show, Locked (Rapunzel’s Lament), took place in a children’s playground, also in Hereford. Silent theatre techniques are now being used by companies in Liverpool, Birmingham and Glasgow. In 2015 Lincoln Center staged a production of the Rocky Horror Picture Show utilizing Quiet Events Headphones, where an audience wearing headphones could switch between the audio for the live performance and the soundtrack of the film version being projected behind it. Street performers have used the concept as a solution to overcome bans on amplification and loudspeakers on the street. In 2016, Irish band Until April began using this for their shows on the street while touring in Germany and Switzerland. ^ a b "silent disco - Definition of silent disco in English by Oxford Dictionaries". Oxford Dictionaries - English. ^ a b "BBC News - ENTERTAINMENT - BBC Music Live events unfold". news.bbc.co.uk. ^ Molzahn, Laura. "Summer Solstice Celebration". Chicago Reader. Retrieved 12 April 2017. ^ "Dance with me..." megduguid.com. ^ "Dueling DJs @ Cultural Center". Gapers Block: Slow Down Archive. Retrieved 12 April 2017. ^ Rothman, Robin A. (June 13, 2005). "Boogie Nights: 'Silent disco' is making itself heard". MTV. Retrieved June 13, 2005. ^ Schmitz, Jowi (5 August 2003). "Amsterdams Parade-publiek bekijkt zichzelf". NRC.nl (in Dutch). NRC. Retrieved 21 May 2018. ^ Carroll, Robert (19 November 2008). "A quiet night out". The National. The National. Retrieved 21 May 2018. ^ "Nico Okkerse". LinkedIn. LinkedIn. Retrieved 21 May 2018. ^ "Festival de Parade Museumpark". Radio433.com. 433fm.com. 2003. Retrieved 21 May 2018. ^ Ojumu, Akin (2008-06-14). "Meltdown: Silent disco, big noise". The Guardian. ISSN 0261-3077. Retrieved 2017-01-24. ^ "Silent Soundclash, RANA, Eric Krasno & Chapter 2 Among Cruises on Rocks Off Calendar". www.jambands.com. Retrieved 2017-01-24. ^ Johnston, Ian (6 September 2009). "Silent disco craze spreads". Daily Telegraph. Retrieved 7 June 2010. ^ "i-Pod flashmobbers dance in their hundreds at station". ^ Stewart, Tim (2007-04-05). "4,000 flash mob dancers startle commuters at Victoria". Evening Standard. Retrieved 2007-05-03. ^ "[:]plug[:] (2005)". deletist.info. 2005-08-31. Archived from the original on 2005-09-24. Retrieved 2016-08-23. ^ "the placard headphone festival". leplacard.org. 2005-08-31. Archived from the original on 2005-10-26. Retrieved 2005-10-26. ^ "Erik Minkkinen". V2_Institute for the Unstable Media. ^ a b Axline, Keith (2005-08-31). "Fest Rocks With BYO Headphones". Wired.com entertainment music news. wired magazine. Archived from the original on 2016-08-23. Retrieved 2016-08-23. ^ Booker, Scott. "Partly Accurate Flaming Lips News". Archived News Relating To The Flaming Lips. Archived from the original on 2007-03-29. Retrieved 2013-02-20. ^ Spirgi, Dominique. "2010 Shift Festival english program". 2010 Shift Festival website. Shift Electronic Arts Festival Postfach CH-4023 Basel Switzerland. Retrieved 2009-01-10. ^ Brimer, Adam. "Bonnaroo Silent Disco Day 1". knox news. Knoxnews.com. Retrieved Dec 10, 2012. ^ Mlynar, Phillip (2012-04-05). "Live: Kid Koala's Space Cadet Headphone Experience Crashes In Brooklyn - New York - Music - Sound of the City". Village Voice. Retrieved 2013-02-21. ^ "Silent Gig featuring Kutosis/Muscle Club and others @ Barfly : Wed 13th August". Joy Collective. Retrieved 2008-08-08. ^ "The Gingerbread House breaks dramatic boundaries in Hereford". ^ "Feral Productions' hoping for another fairytale ending at The Courtyard in Hereford". ^ "Quiet Theater". Quiet Events. Quiet Events. Retrieved 3 April 2016. ^ Itzkoff, Dave (2015-08-09). "'Rocky Horror' at Lincoln Center, With Headphones". The New York Times. ISSN 0362-4331. Retrieved 2015-09-25. ^ "Galway duo find novel way to overcome amplifier bans on continental Europe". Retrieved 2016-07-21.